Welcome to the Los Angeles Mental Relaxorium, Los Angeles' premiere location for advanced treatment of the very very stressed. We are proud to be on the forefront of the mental health frontier by offering our patients the ability to set up websites, presented here, as an optional course for occupational therapy. Please enjoy our site. On the navigation area below my ad, please place your mouse over an area to learn more about it and click to go to that particular page. Be the second person on the PLANET with Relaxorium stuff! Merchandise so EXCLUSIVE that NO ONE will understand why you've got it! Ain't that GREAT? Click on the image on the left to go see the neat stuff you can get! 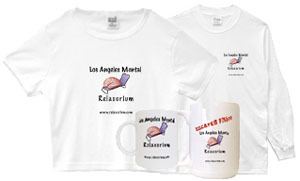 Shirts that say "Escaped from the Los Angeles Mental Relaxorium"!